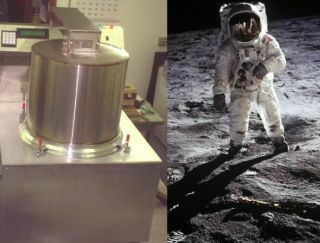 On left, a space laundry machine designed by UMPQUA. On right, Astronaut Buzz Aldrin, lunar module pilot of Apollo 11, walks on the surface of the Moon. Imagine putting dirty clothes into a washing machine, leaving, and only coming back once the freshly cleaned clothes have been dried out by microwaves. That out-of-this-world-laundry concept could someday become a reality for astronauts and space explorers headed for the moon, asteroids or Mars. Such a washing machine is designed to clean dirty astronaut clothing inside a sealed plastic bag that can also receive a drying blast of microwaves. The simple one-step process represents an energy- and water-efficient solution that spares space travelers from hauling a water-intensive washing machine up into space or bringing along disposable clothing. Astronauts aboard the International Space Station can get by with specially engineered, stink-free underwear and steady resupply missions launched from Earth. But longer-lasting missions beyond the moon won't have such luxuries. "On a long-duration mission to Mars you won't have resupply — you either have to fly naked or have a washing machine," said William Michalek, project manager at the UMPQUA Research Company. "I haven't heard of them flying naked, and I don't think that's really an option." NASA recently chose UMPQUA's washing-machine concept as part of its selection of Small Business Innovative Research proposals eligible to receive up to $125,000 in early funding. An earlier version of UMPQUA's machine avoids making the foamy mixture of detergent, water and air — something that would be troublesome to handle in the seemingly weightless space environment. The company also faced the challenge of washing clothes without the tumbling or back-and-forth action of typical washing machines that require Earth's gravity to work. "We developed a system of water jets inside a plastic bag with clothes and water and no air," Michalek told InnovationNewsDaily. "The jets would bend the clothes back and forth to work the soap solution through all the fibers." The water only enters the plastic bag through connected tubes after all the air has been sucked out first. Once cleaning is done, the clothes stay in the bag within a larger chamber as a microwave generator irradiates them — similar to heating up a microwave meal inside a Tupperware container. Finally, a tumble cycle uses air jets to make any space laundry extra soft. The design conveniently saves astronauts time they might normally spend switching wet clothes from a washer to a separate dryer. UMPQUA plans to make a more energy- and water-efficient version of its device with the new NASA funding. It also wants to vaporize some of the water with outside vacuum pressure on the bag in order to temporarily free up more room inside the bag during the cleaning process — a concept it must prove within the next six months. The company originally worked with Westinghouse, a home-appliances manufacturer, on the microwave-drying concept. That could still find its way into commercial washing machines on Earth, Michalek said. But Westinghouse didn't like the idea of a combined washing and drying machine because it doesn't allow people to simultaneously wash and dry big loads of laundry quickly, even if it might be more time-efficient for astronauts' purposes. So when might people on Earth see a water-efficient washing machine that combines both cleaning and drying? "When we get to the point where we're wearing dirty clothes because we don't have enough water to wash them," Michalek said.